This is an excellent and important accomplishment to crow about in a screen name. It is infinitely better than the endless parade of inanities like "JodysMom." 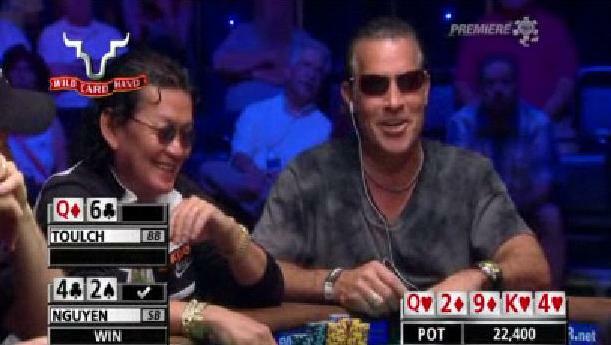 Norman Chad, in ESPN broadcast of World Series of Poker Main Event, August 31, 2010. 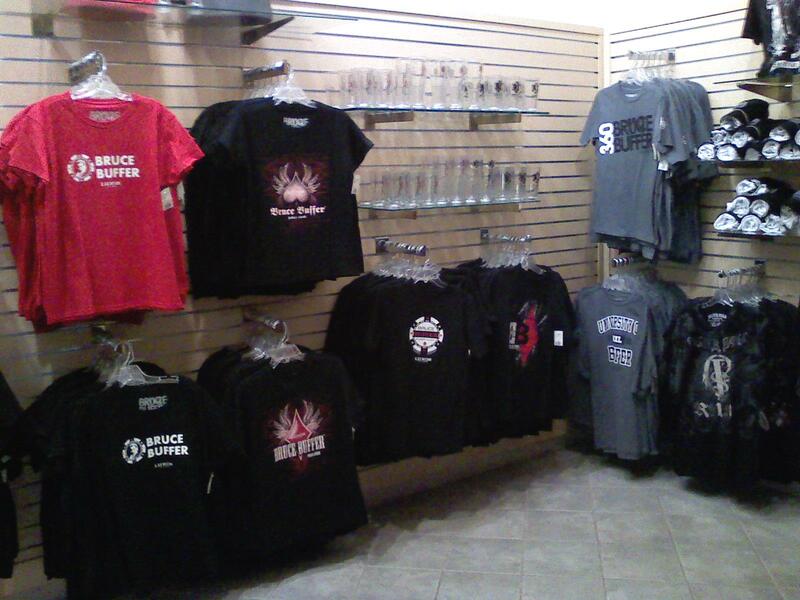 Most of life is jack-deuce offsuit. Last night at Mandalay Bay we had a player at the table who had a smarmy move that he pulled every time he had the winning hand. Instead of showing both cards right away when it was his obligation to do so, he turned them face up stacked together, so only one was visible. Then, after a dramatic pause of a few seconds, he would shift the top card over slightly so as to expose the bottom card. 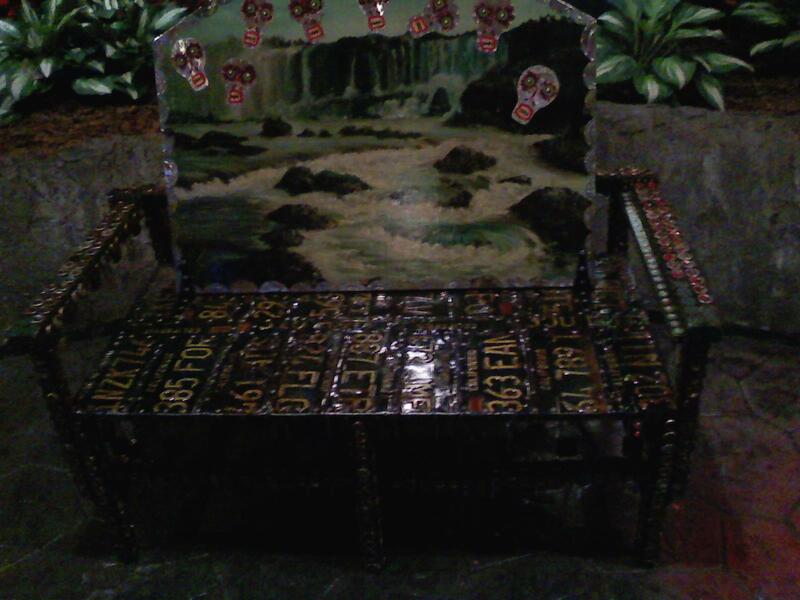 The first time the guy at Mandalay Bay did this, it was an all-in and a call, on a queen-high board. His opponent showed A-Q. Monsieur Le Chiffre turned his cards over with a queen showing, waited a bit for the tension to grow, then moved aside the top card to reveal the case queen underneath for the winning set. 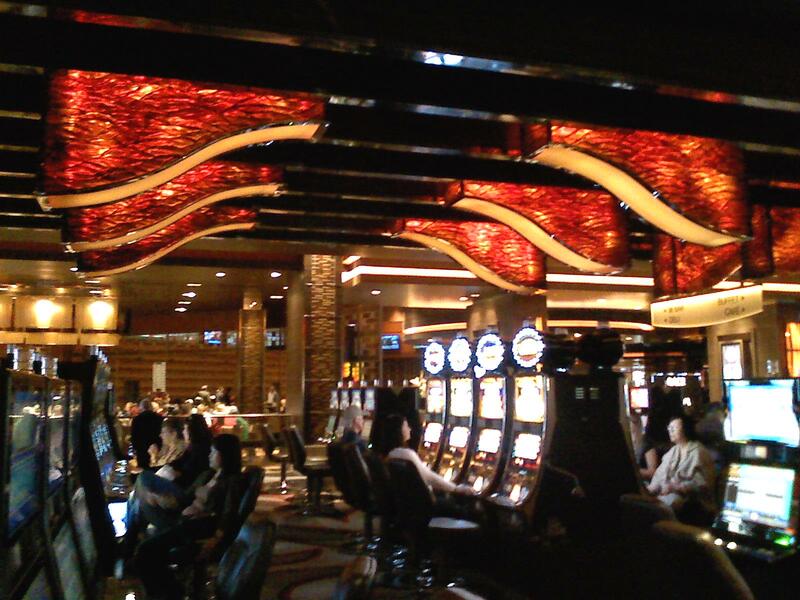 I played last night at Mandalay Bay. Fairly early in the session, I had a situation in which I ended up folding the Mighty Deuce-Four, after having flopped trip 4s. That doesn't happen often--in fact, never has before--so I thought I'd tell you about it. To my surprise, though, the button raised to $80. 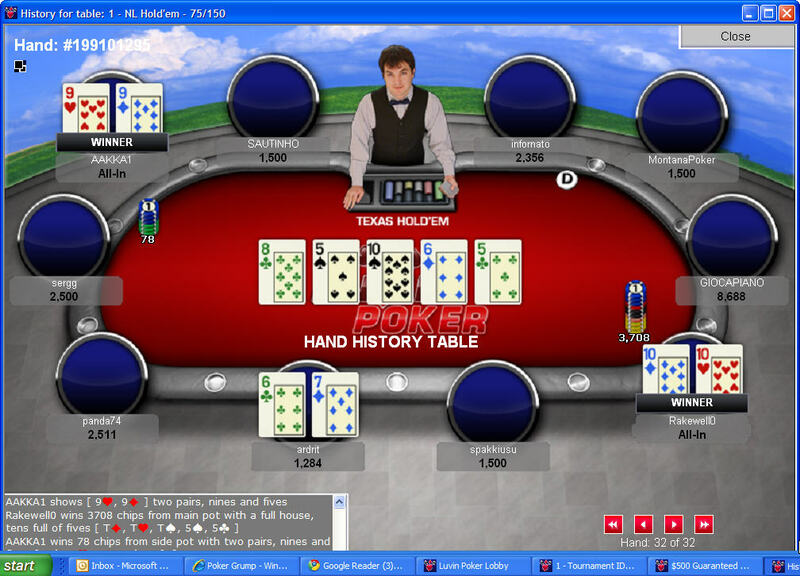 He was new to the table, having been there only a few hands, so I had no sense of his play. 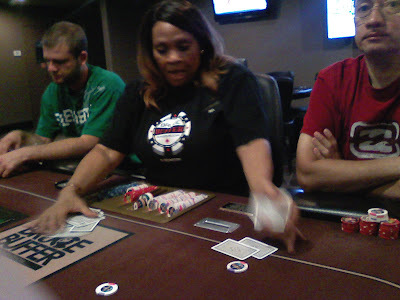 UTG, a completely straightforward, A-B-C player, agonized for quite a while, then folded. No question in my mind that he had a big overpair, which had been the most likely thing from the get-go. But now what do I do? Very few $1-2 NLHE players raise with just a flush draw, even the nut flush draw and even on the button, especially against two opponents, and especially when the board is already paired. If he had flopped a full house, with 6-6 or 4-6 in hand, I don't think he would raise there. More likely, he would assume and hope that one of his opponents (in this situation, more likely me) was on a flush draw, and he would want to let that hit, so as to maximize the chances of capturing a whole stack. So I pretty much ruled that out. Could he have a big overpair? Maybe, but not very likely, I thought. If he had kings or aces, he probably would have reraised pre-flop, and without them, he would have to be worried that UTG had a bigger pair. The most obvious conclusion is that he had the case four with a bigger kicker. What hands would a typical player be willing to call an UTG raise with? Only two answers: Suited A-4, or maybe the suited connectors, 3-4 and 4-5. If he had A-4, I could catch up only by hitting my kicker, drawing to three outs. If he had 3-4 or 4-5, chances are we would chop the pot in the end (11% I win, 13% he wins, 76% we split it). However, there was no doubt in my mind, from the way he placed his bet, that in order to get to that point I was going to have to commit my stack, which was a little less than his. Even if he had turned his hand over at that point so that I could see a 3-4 or 4-5, I'm not sure I'd be willing to risk the additional $200 or so in order to be able to claim about $15 profit (my half of the $35 that UTG had put in and abandoned, minus the rake). When you add in the very real possibility that I was up against A-4 (13% I win, 70% he wins, 18% chop), it seemed like a bad gamble. 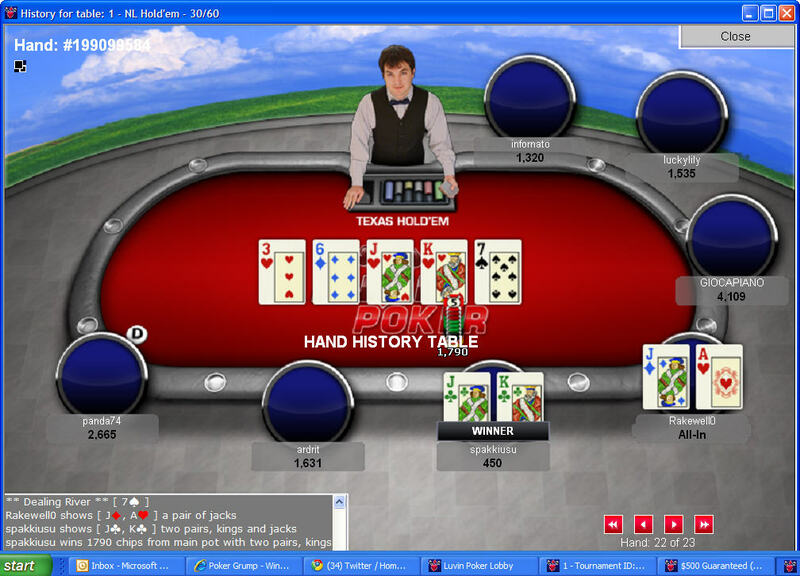 I decided to fold, which is pretty darn rare after flopping any three of a kind. I thought that I'd see if I could coax from him some confirmation of my decision, so I folded face-up, smiled, and said, "Let's see if folding this is the right move." In response, he flashed me the 3c before giving his cards back to the dealer. He could not have had the 3c-4c, since the 4c was on the board. I doubt that he would have played an unsuited 3-4 in that spot. 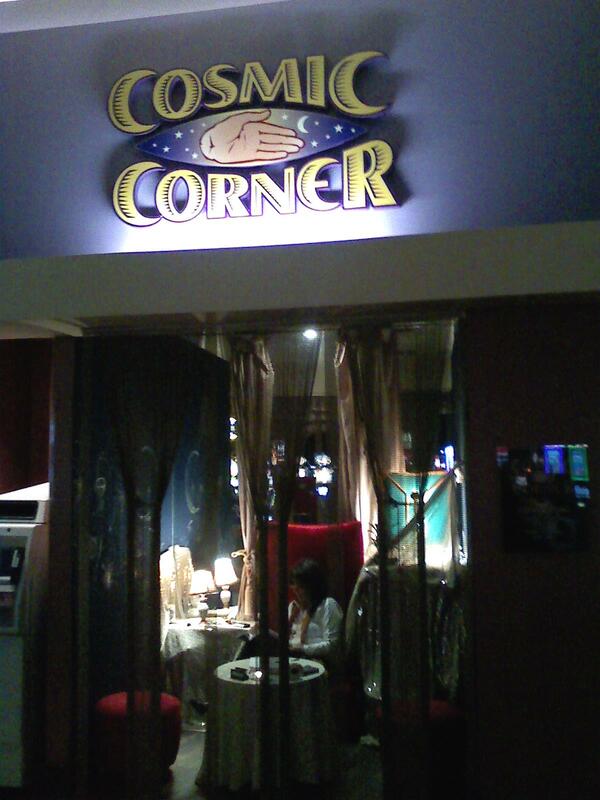 That leads me to the conclusion that his most likely hand was 3c-5c, for the flopped open-ended straight-flush draw. I admit that that's a possibility that I hadn't thought of at the moment, but it makes perfect sense. 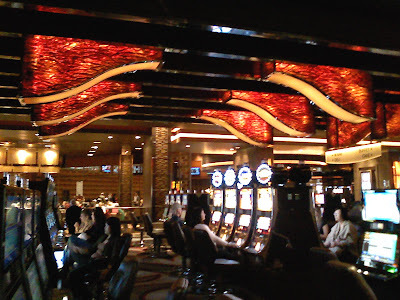 Especially with the overlay of an extra couple of hundred bucks from a high-hand jackpot, he would understandably be willing to play for stacks in that spot, even if he knew he were up against somebody with made trips. Now here's the most interesting question: If he had shown me the 3c-5c there, what would be the right move? Call, fold, or shove (the latter being with the assumption that he would call)? As I thought about it immediately after the hand, I thought that we were just about 50/50, as he would presumably have 14 outs to beat my trips (the usual 15 that an OESFD brings, minus the one deuce I was holding). I'm not a fan of flipping coins for stacks, since there will almost always come far better situations than that if I invest a little time and patience. But to my surprise, now that I run it through an odds calculator, I would have been farther ahead than that guesstimate. In fact, I would be a 61%/39% favorite. In retrospect, it's obvious that that's because of all of the boats I could make that turn his outs into what some have proposed calling "douts"--cards that make a hand but don't make it the winner. He had two cards that would give him a lock, but failing that I had seven cards on the turn and then ten more on the river that would fill me up or make quads. So if I had actually seen what I assume now that he had, and had been smart in my thinking, yes, I would have been happy to match stacks with him on that flop. Even as it was, with my assumption that he had the last 4 in the deck, maybe I should have had more faith than I did that I would be sent a miracle deuce to beat his better kicker. I hang my head in shame at my faltering and wavering. My early religious training comes rushing back to me, and I remember the touching story of the man who brought his son to Jesus for the casting out of an evil spirit (Mark 9:17-30). He was told, "All things are possible to him that believeth." The man's plaintive reply was a classic, and I now invoke it to the poker gods: "Lord, I believe; help thou mine unbelief." Most avid poker players have heard the story of Jennifer Harman winning a WSOP bracelet in deuce-to-seven (no-limit), having never played the game before, after just a few minutes of strategy coaching from Howard Lederer. "I told him that I had never played before. I hadn't even played triple-draw. I had played no deuce. So, I asked Billy to give me some pointers, and he gave me a five-or 10-minute lesson." And that, combined, obviously, with his excellent general poker knowledge and instincts, was enough to propel him to the win. My first tournament on the Everleaf Network is over, with no money for me. So sad. So we see that this site, like so many others, is obviously rigged. Three players with A-Q??? Rigged for sure. The game software seems OK--at least I didn't immediately notice anything annoyingly awkward or stupid about it. At first there was a voice announcing every action, which would have driven me to distraction, but I quickly found the way to shut it off. I can't really judge the quality of play because the structure rewarded playing somewhat crazy. Sometime soon I'll joing a more normally structured tournament and see how that goes. I've had enough fun for today. Also need to get my trademark innocent-looking lamb avatar uploaded. 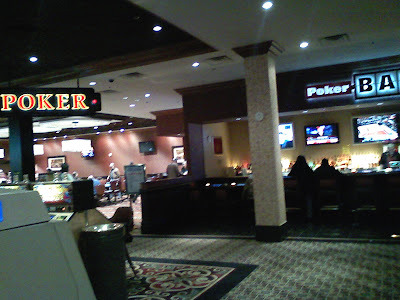 After reading this morning about the various online poker networks, I was reminded that I don't have an account at any of the Everleaf Gaming sites. I had tried signing up for Victory Poker a month or two ago, but the process got fouled up somehow and didn't complete. Just as well, since that PokerNews story this morning informed me that Victory has up and moved over to the Cake Network, where I already have two accounts (Cake itself and Doyle's Room; the latter is the only one I use and the only one with money in it). PokerNews, of course, is an affiliate for many sites; the news portion is the loss leader that draws you to sign up for online poker, which is how the site actually makes its money (or so I've been led to understand). There was a convenient link on the page of the story I was reading, so I took the path of least resistance and signed up for Luvin Poker. This is apparently one of some 80 or 90 Everleaf skins. The download and registration were pretty painless. It was a pleasant surprise to discover that I could make a desposit using my Visa card (an ordinary card, not a gift card or anything like that), despite various attempts by my own elected officials to make that impossible (damn meddlers, busybodies, and control freaks one and all). The only annoying thing was that I had to enter all the credit card info separately on two different forms, but I got over that pretty fast. That's 1/10 (me) waiting for a $5 NLHE game, 1/10 for a 0.10 Euro NLHE, 1/10 for a 0.10 Euro PLO, and two heads-up tables with one player waiting, with the highest buy-in being $1. I signed up for mine 45 minutes ago, and I'm still the only one registered. Don't bother counting; I'll just tell you that it's a grand total of ZERO waiting for any of those games. 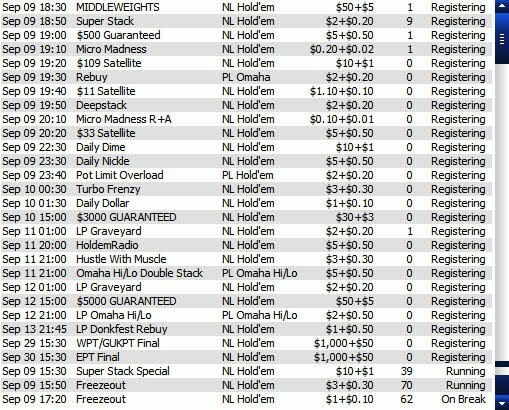 That $5 one third from top, I'm the only registrant at the time I snapped this. It's about to start now, and there are 11 signed up so far. Nice overlay! Definitely a lot more going on in cash than tourneys, but if you look more closely, you see that it's essentially all microstakes. If you get up even as high as $0.50/$1, it's an empty wasteland. Can't tell you about the gameplay or software yet. I'll come back later for that. 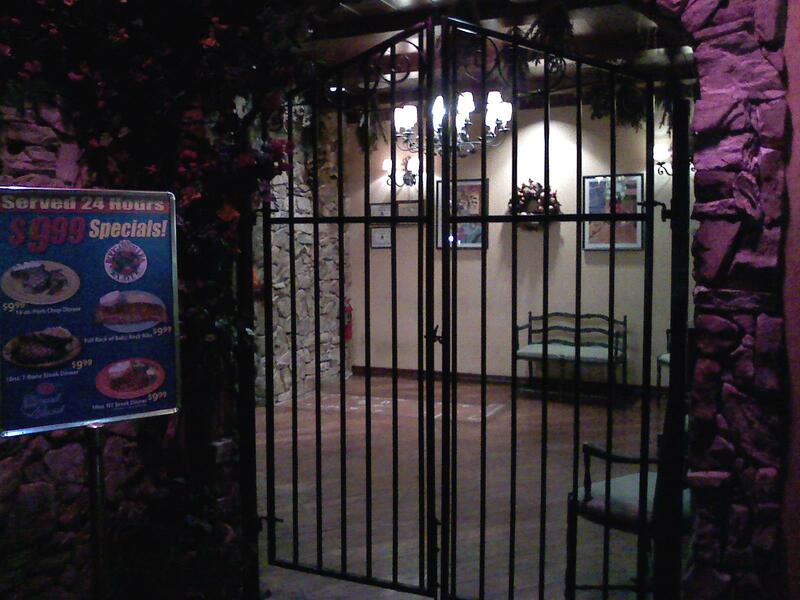 One annoying oddity I've found so far: You can only have one tournament lobby open at a time. 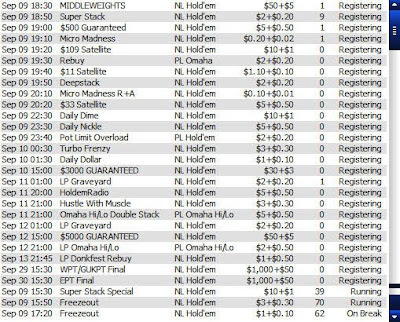 That means that now that I have this MTT lobby open, the one for the SNG I signed up for snapped shut, so to keep an eye on whether it's filling up, I have to go to the main lobby and scroll down the list of SNGs, find the right one, and look at the numbers. That's just stupid. Does PokerStars deserve some blogger love for this? Yes. Yes, they do. Just call me "Spicy Aria"
That's the rather bizarre poker nickname selected for me by the system at http://pokernickname.com/. I think I'll stick with "Rakewell," or "Grump"/"Grumpy." The obvious headline is "Leaving Las Vegas"
Often when there's a news story about something or other becoming more or less frequent or popular, you will search the story in vain for anything like, y'know, numbers to back up the assertion in the headline. But to its credit, the Las Vegas Sun reporter goes out and tracks down some actual data about the mass exodus from this city. I remember that when I moved here in 2006, I heard numbers like 3000 or 4000 people a month moving here, really incredible (but apparently then true) growth statistics. No longer. PokerNews has a very useful rundown on the current roster of online poker networks and their skins, including which are open to U.S. players. Too bad they didn't add a note about Mac accessibility. They also misspelled "Unabomber" as "Unibomber." Phil won't be happy about that. 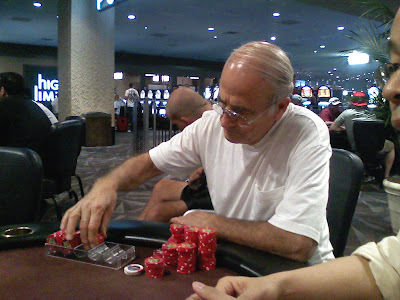 You may remember a few years ago at the World Series of Poker on the very first hand of the Main Event Sammy Farha had A-10, and another guy (seems to me it was a lesser-known Hollywood actor, but now I'm forgetting who it was; I guess that's because he's lesser known!) had 10-10. When the flop came A-A-10, it was pretty much inevitable that they'd get all the chips in. This year, Card Player columnist Matt Lessinger lasted only about 25 minutes before running into the bad side of a set-over-set situation against Johnny Chan, and getting knocked out. This kind of thing has made me wonder many times how likely it is that somebody in the vast field of the Main Event is unlucky enough to be on the ugly side of A-A versus K-K on the very first hand. My inclination, without running any numbers, has been to think that it probably does happen in a typical year. Today, thanks to another bout of insomnia, we're going to find out. We start with the hardest calculation already done for us. 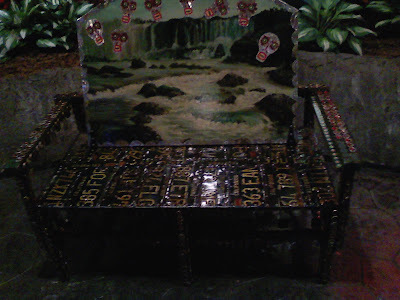 The probability of two specific pairs being dealt turns out to be a much more complicated calculation than one would think, but fortunately for the math-impaired among us, Brian Alspach worked it all out years ago and posted his work here. 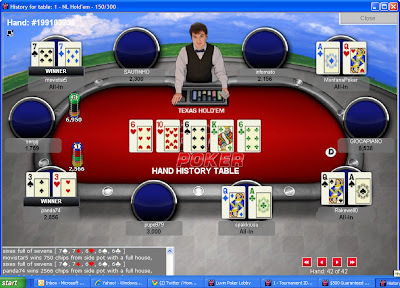 If you jump all the way to the bottom table, you can just read the answer: If one person is dealt K-K, the probability that he is facing an opponent with A-A at a nine-handed table is 0.0439. So what is the probability that somebody has K-K? That's not too hard. If you draw two cards at random from the deck, the probability that the first one will be a king is 4/52, or 1/13. If that worked, then the probability that the second one is also a king is 3/51, or 1/17. Combine those, and the answer is 1/221. Using a binomial probability calculator, such as the one here, we can quickly discover that the probability of somebody at a nine-handed table being dealt K-K on any given hand is about 0.04. Therefore, the combined probability that somebody has K-K and somebody else has A-A is 0.04 x 0.0439, or about 0.00176. 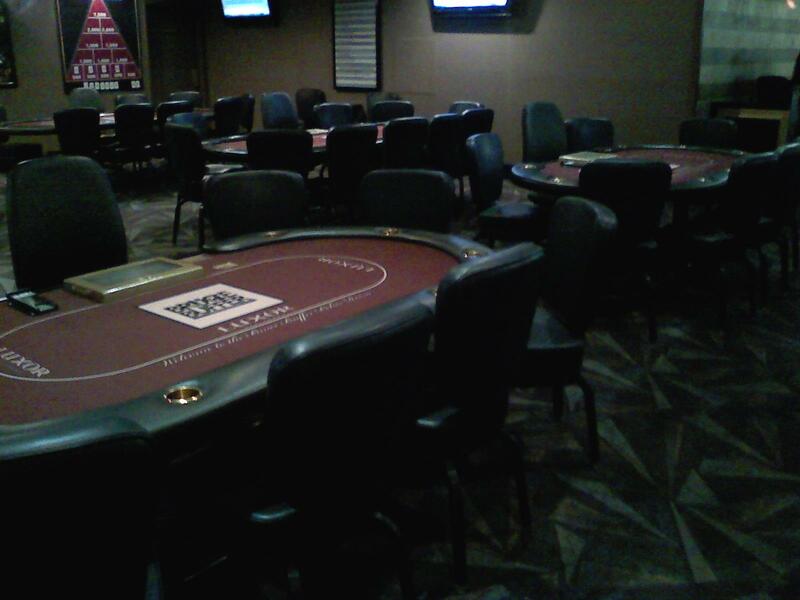 At this year's Main Event there were 7319 contestants, or just over 813 tables with nine players each. Yes, I know that they didn't all play on the same day, and not everybody showed up for the first hand, and they didn't have a perfect arrangement of all tables being exactly nine-handed except for one. But let's pretend that all of those things were true. They're close enough for my purposes, which is just to get an estimate of the overall probability. Turning again to the binomial calculator, we plug in n=813, k=1, and p=0.00176. The computer instantly tells us that the probability that exactly one table in the field has K-K versus A-A is 0.34. The probability that at least one table has that confrontation is 0.76. The conclusion, then, is that my hunch was right. 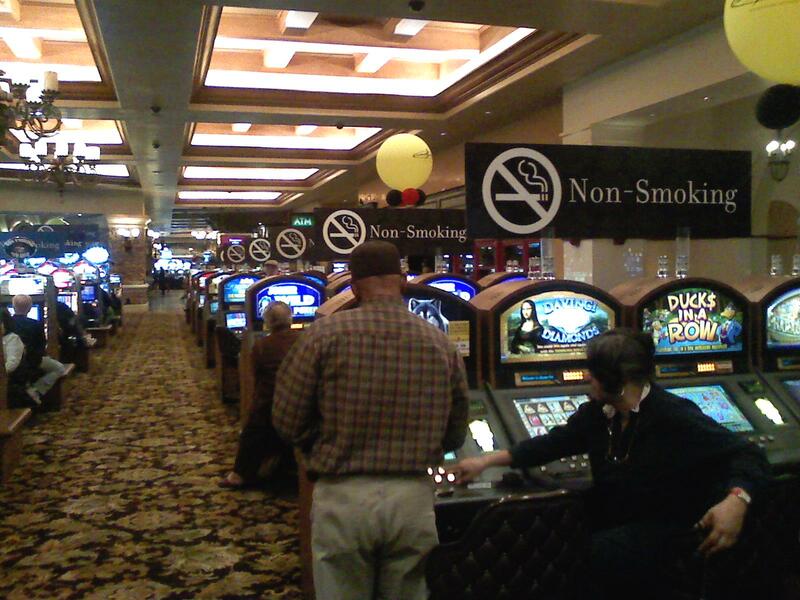 In a field of this size, the odds are about 3:1 that at one or more tables, right after "Shuffle up and deal," somebody is facing his worst nightmare. Of course, that doesn't mean that the two players necessarily get all their chips in, nor that the guy with kings loses and goes home. Maybe Mr. K-K can find a fold after about the fifth pre-flop raise, or when an ace flops. Or maybe he gets lucky and hits a set to felt the guy with aces. What happens after the deal is much harder to figure out mathematically. But I'm setting aside all of the consequential action. All I care about is this fact: In about three years out of four, on average, at least one person will be so unlucky as to be looking down at kings on his very first hand when somebody else at his table is looking down at aces. One way or another, that's gonna leave a mark. Trivia: The title of this post is a sly allusion to the song "Scotty Doesn't Know," from the 2004 film "Eurotrip." In the movie, that song is performed by the character played by Matt Damon. Matt Damon, of course, was in "Rounders," which featured a clip of the final hand of the 1988 WSOP Main Event And who won the WSOP Main Event ten years after that? Scotty, that's who. Is that a freaky coincidence, or what? Earlier this year I read somewhere--and now I can't remember where, but perhaps in one of Phil Laak or Jennifer Tilly's columns in Bluff magazine--about how the players in this season's PartyPoker Big Game series got to pick their own entrance music, the theme that would be played upon their grand entrance to the poker rooom. It's not especially likely that I'll be invited to play on that or any other televised poker show anytime soon, but upon reading that, surely I'm not the only one who starts imagining what music I'd pick should that miraculous day ever come. It didn't take me long to decide. For as long as I can remember, there has been one piece of music that for me most perfectly embodies the idea of triumph, which is what I would want to convey in that kind of setting. No, it's not the theme from "Rocky" (though that's not half bad). It's the final movement of Beethoven's Symphony #7. So if you ever hear that the Poker Grump is going to be appearing on the Big Game, here's what you can expect to hear as I am seen walking through the casino door. This is a performance conducted by the man who could put the brio in an allegro con brio like nobody else, the late, great Leonard Bernstein. Enjoy. 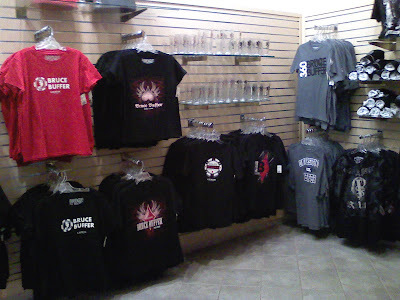 Hell hath no fury like a nit with aces cracked. 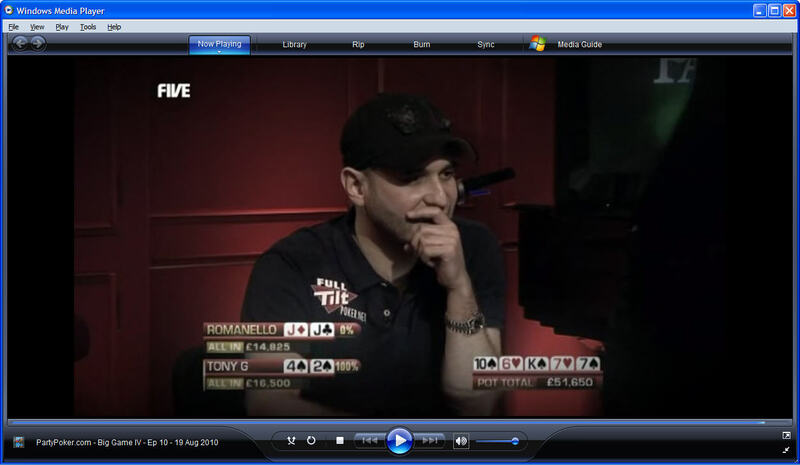 This is a screen shot from the final hand of a recent episode of the PartyPoker Big Game. I don't like Tony G, but the man obviously understands the power of the Deuce-Four. I was playing today at Caesars Palace. During one hand, a player put out six red chips ($30), in two stacks of three chips each. For some reason, the dealer saw only one of them (probably because the second one was kind of close to the pot, and he thought it was already part of the pot). He announced the bet as $15. I asked him to check that. He looked again, realized his error, and said, "Make that $30." A few seconds later he quipped, "I'm just so used to those two-and-and-half-dollar chips." 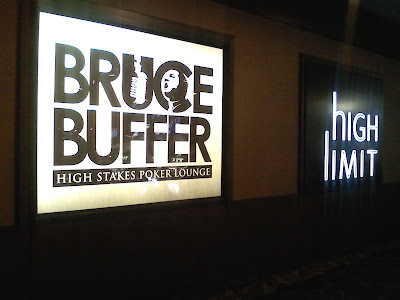 A week ago, I had never heard of Bruce Buffer, as far as I can recall. Then I watched the most recent week of "Poker After Dark," which featured him, two mixed martial arts fighters, and three poker pros. Mr. Buffer acquitted himself rather well, I thought, finishing a close second to Howard Lederer. He was also pleasantly chatty and unfailingly polite. I learned from this that he is a ring announcer for MMA fights, and that he does a cute little move called the "Bruce Buffer 180," which, frankly, I don't get, but which seems to drive fans wild. You can see it in action here. 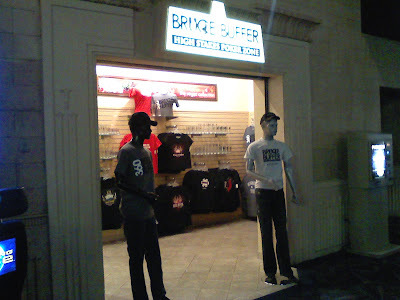 So that exhausted my knowledge of Bruce Buffer. 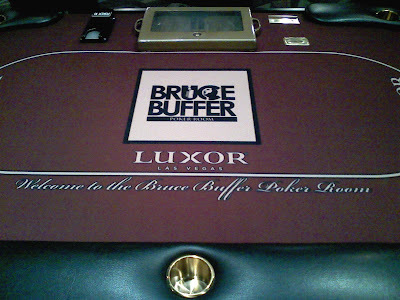 Imagine my surprise upon walking into the Luxor Poker Room today and finding that it was, in fact, no longer the Luxor Poker Room, but had been redubbed the Bruce Buffer Poker Room. This is the Bruce Buffer Wall. The two monitors on either side of the big sign cycle through a slideshow of Bruce Buffer Photographs. OK, that was just mean and uncalled for. I apologize. 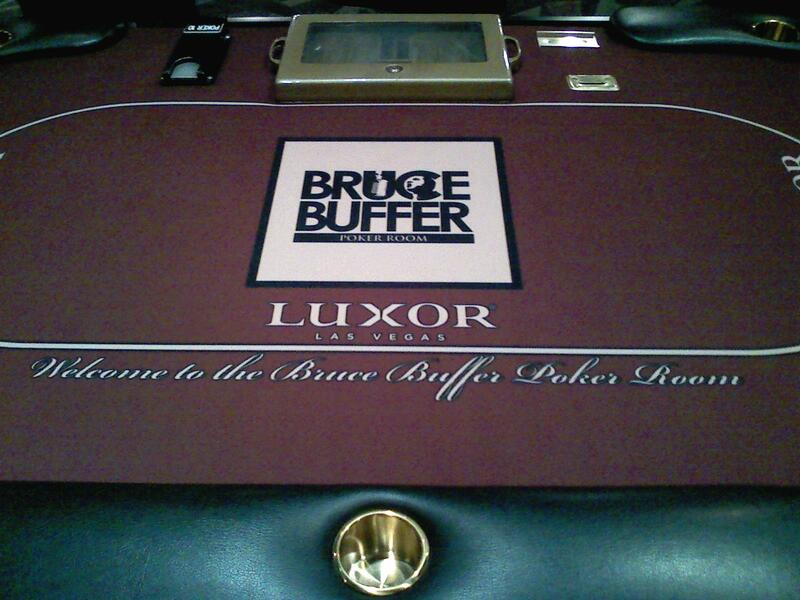 Anyway, the one obvious touch that appeared to be missing was the Bruce Buffer Poker Chip. Perhaps it's in production. 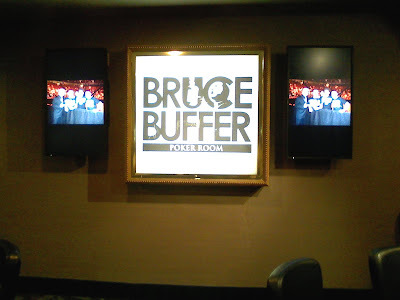 My understanding--and it's possible I'm mistaken on this point--is that the all-you-can-eat dining area has been renamed the Bruce Buffer Buffet. 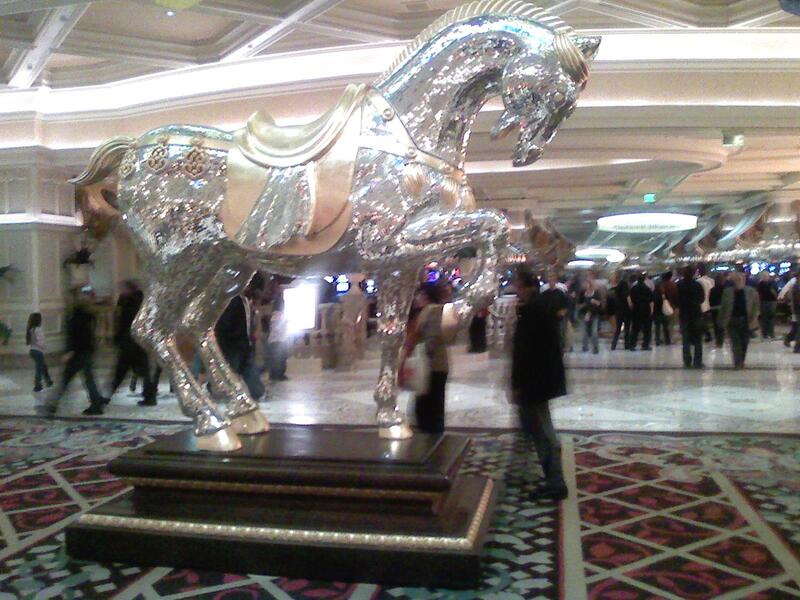 I have another suggestion for the Luxor. 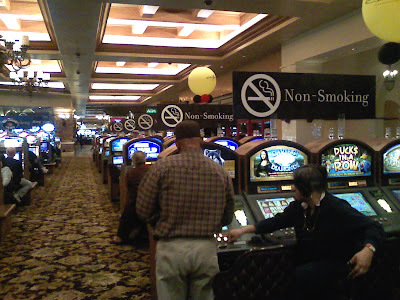 They need a clear demarcation between the gambling/drinking/adult-only portions of the operation and the parts of the casino that are open to minors. They should set up kind of a no-man's-land between these two areas and call it (you're way ahead of me here, aren't you?) the Bruce Buffer Buffer Zone. I have to admit that I don't really see the point in all of this folderol, but it seems harmless enough. As I sat down and prepared to play, I thought I heard a voice in my head saying, "Llllllllllllllllllet's get rrrrrrrrrready to rrrrrrrrrun bad!" But I might have just been imagining things. 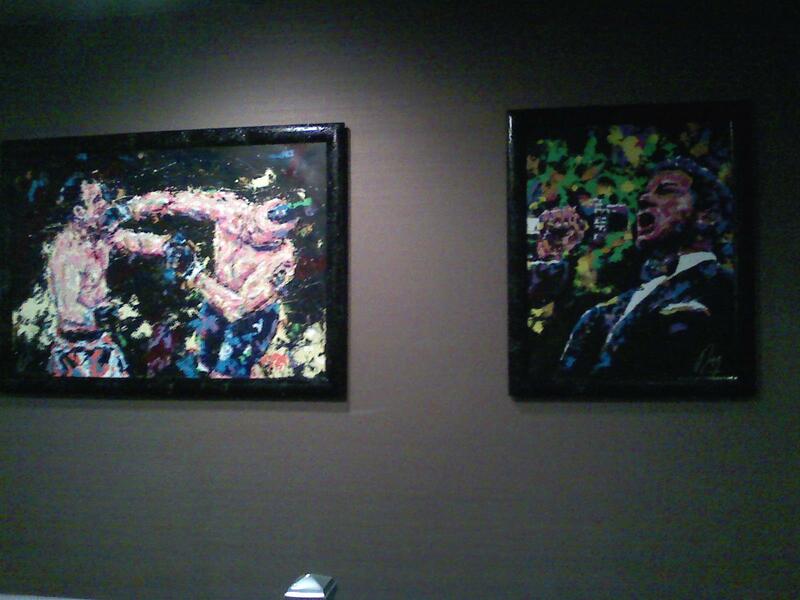 You'd probably only hear that in the Michael Buffer Poker Room, wherever that may be. This week's "loose cannon" was horrible. Fortunately, he was busted on Thursday, and replaced by Jason Mercier, so for Friday we had an all-pro game. The most satisfying part of the show is a classic display of Hellmuthian bad play, bad luck, whining, swearing, and bragging. Oh, and LOSING! Hee hee hee! I obviously have no way to verify any of the accusations. I await further eyewitness accounts. For the final and longest story, I checked Michael Binger's blog, because he is named as a vocal objector to the ruling made, but there's nothing about it there yet. Binger is unquestionably one of the brightest minds in poker, and, from everything I can tell, a completely ethical straight shooter (except for the fact that he agreed to be a pro for the cheatingest online site on the planet, and except for the fact that he knocked Cardgrrl out of the HORSE tournament at the WSOP on a horrendously bad beat, which is even more unforgiveable). I first learned of this story from Richard Marcus's "Poker Cheating and Casino Cheating Blog," here. It rather nauseates me to have to post that link, but integrity requires it. It's ironic to speak of integrity in the same paragraph as Marcus's name. On several occasions I've called him out on his dogged refusal to follow ordinary ethical practices in blogging; see here, and then follow links backwards. He's a slime bucket. I continue to subscribe to his RSS feed because it does serve as a useful aggregator of news on the subject; if there were another that did the same but treated its source material with normal respect, I'd use it instead. In this case, Marcus does not name the source, does not link to it. In fact, he tries to make it sound as if he has personally been hearing these stories from the French poker tour from his own private sources, and his publication of them is original. I did a Google news search for "Mike Matusow Partouche" and quickly found the Pocket Fives post noted above. I then discovered that it contained in one place all of the allegations that Marcus names. His post tries to make it sound as if he is compiling them from multiple independent sources, but in reality, he has just plagiarized one pseudonymous post. I have zero hope of reforming Marcus; I believe him to be an unredeemable thief and cheat. But I feel some obligation to point out his ethical violations when I become aware of them.